Peak power figures cannot not be compared to a Dynojet, which are typically 10-15 hp lower. Power gains however should be similar. These figures are at the hubs and not at the flywheel. These figures are SAE corrected for temperature and atmospheric pressure. This car was brought to us in untuned form with a Black Magic II and VAFC. It was running very rich at part throttle and at cranking, and dangerously lean at full throttle and had not been dynoed since its installation. We recommend that everyone should dyno any high performance upgrade to ensure it is running correctly. After adding a lot of fuel the air fuel ratio was brought down to a much safer level. Due to time constraints the VAFC fuel tuning was not finished, however the all the fuel settings over 4000 were set to the maximum allowable. It was running too rich down low causing the turbo to spool up more slowly. Further leaning would have improved the spool up. With all the supplied electronics the car made a reasonable 277hp. A little more power could probably have been extracted by leaning out the top end a little more. The dip at VTEC is fairly typical using stock ECU. 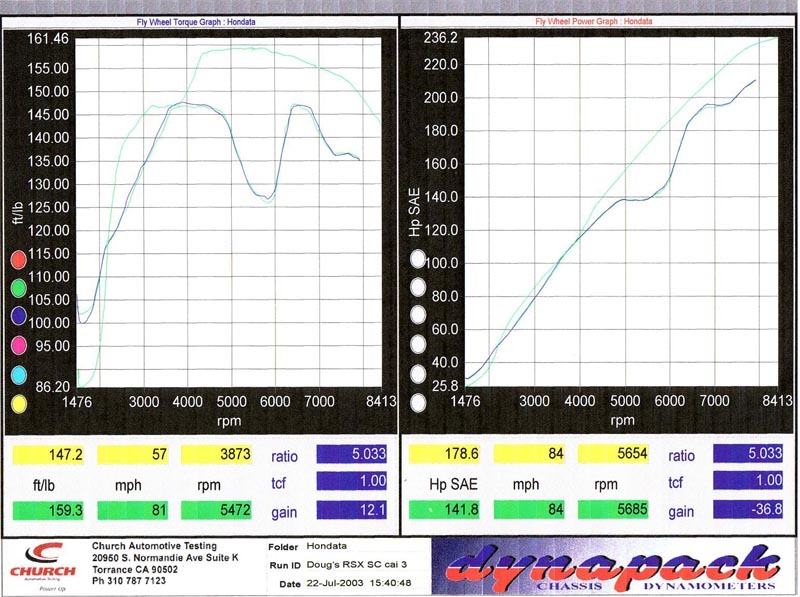 Here is an example of another boosted RSX with a VTEC dip running on a stock ECU for comparison. The supplied 3.1 ohm peak and hold injectors were very difficult to tune. These pintle injectors required significant fuel changes all over the maps. For these power levels we recommend the 12 ohm injectors as the injector behavior is much closer to stock and far easier to tune. In later dyno runs the injectors were swapped to 650cc 12 ohm injectors, although 750cc 12 ohm injectors could have been used. 12 ohm injectors are also easier on the ECU and wiring as they use one fourth of the current. The significant power gains achieved were as a result of ( in this order) ignition timing, lowering the VTEC point and adjusting the cam angles and fuel mapping with the K-Pro. Note that the K-Pro tune runs richer at 5800 rpm but makes 40 ft pounds more torque. It is our opinion that difference in power between the VAFC once leaned out a little above 7000 rpm, and K-Pro at peak power would be less than 10 hp. With a gearchange at 8500 rpm the average power increase is substantial. Although fuel pressure was not measured it is our recommendation that anyone running these power levels (over 300hp) upgrade to a larger in tank fuel pump (such as a Toyota Supra fuel pump) as we strongly suspect the pump was at maximum capacity. After all these upgrades, the weakest links will then be the pistons and rods. After several successive hot runs we advanced the ignition timing from 7500 rpm up The peak power (solid blue line) reached on this run was an impressive 331 hp, but as is our tuning procedure, we always elect to sacrifice the last 10 hp by retarding the ignition for reliability. The power would probably have been higher had the engine not been heatsoaked. The effect of the heatsoak can be seen by the reduction of the torque from 4000-7400 rpm. The relevant point here is a 62 horsepower increase at 7800 rpm.